No time to read? Listen to the audio version. Ingredients: If you liked the parody of Spinal Tap, the comedy of Wayne’s World, and the plot of Moulin Rouge, then you will like this movie. The concept for Rock of Ages, that’s ‘rock’ as in the music genre not the mineral, is a pretty simple one: let’s get some celebrates to sing Karaoke and make a movie out of it. And you know what, it was actually pretty damn good. 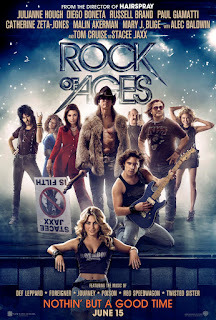 The plot is cliched but seeing as Rock of Ages is oozing with everything 80’s, it only makes sense to have a cheesy story. Sherrie Christian (as played by Julianne Hough) is fresh off the bus from Oklahoma trying to make it big in Hollywood with only her love of rock to guide her. She runs into fellow rock enthusiast and bartender, Drew Boley (Diego Boneta), who gets her a job at the Bourbon Room which just so happens to be days away from featuring the return of rock legend, Stacee Jaxx (Tom Cruise.) Sherrie and Drew’s newly budding love gets put to the test while the Bourbon Room fights against the mayor’s wife, Patricia Whitmore (Catherine Zeta-Jones), who’s crusading to banish rock n’ roll from the Hollywood strip once and for all. This movie is absolutely filled to the brim with 80’s nostalgia and I just loved it. The characters are funny and extremely likable. Alec Baldwin and Russell Brand steal the show as Dennis Dupree and Lonny, the veteran rockers running the Bourbon Room. As this is a musical flick, the remixes of classic rock songs are abundant, maybe a little too abundant. The movie’s runtime is a little over two hours and at times you can feel it start to drag on. And songs are either hit or miss. The hits are phenomenally funny but the misses are painfully goofy. As I mentioned already, the plot is reminiscent of Moulin Rouge in that the central theme, besides rock of course, is all about love. But with a movie composed of 80’s rock ballads, what more could you expect? The funniest part of Rock of Ages has to be Tom Cruise playing the Rock God, Stacee Jaxx. He’s so purposely over-the-top that you can tell Cruise was having a blast with the character. Same goes with Catherine Zeta-Jones. In fact, everyone was pouring their heart out in their performances and the movie is 10 times better for it. So confession time. Musical films are kind of my guilty pleasure. I love ‘em! The sudden jump into a song with impromptu choreography always brings a smile to my face. I grew up watching Blue Brothers, Little Shop of Horrors, Rocky Horror Picture Show, Grease, The Wiz, Nightmare Before Christmas and nearly every Disney movie. I’m always on the lookout for the next big musical release -- except for the High School Musical series, of course. It’s a guilty pleasure, not brain damage. But I’m happy to say that I can add Rock of Ages to the list of musical successes. All in all, a fun movie, a fun experience and great music that'll stick in your head for the next few days. I highly recommend it and rock on. Hey all movie fans, buffs and internet junkies, Movie In A Blender is your one stop place for movie news, reviews and trivia. We update weekly every Wednesday and Saturday. You got an opinion? You want to make a statement? Maybe you just want to say "hi." Well contact us here. Movie In A Blender. Powered by Blogger.